Our clients can avail from us superior quality Abrasion Tester. The Abrasion Tester offered by us are designed to determine the wear and durability of paper and board, ceramics, plastic, textile, rubber, flooring, and painted lacquered and electroplated surfaces. Also, our Rubber Abrasion Tester is electrically driven with predetermined digital cycle counter selections 1 to 99,999 with vacuum dust extractors. The Abrasion Tester is available with single Abraser unit and with Double Independent Abraser units. 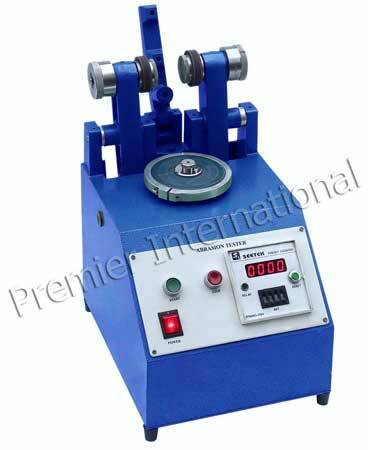 We are popular for making available the most productive Abrasion Resistance Tester India.